Fans of Capcom's excellent Resident Evil 5 will get their first big taste of DLC tomorrow with the addition of a new campaign mode chapter called "Lost in Nightmares" and a revised version of The Mercenaries with a few new characters. I've never been a huge fan of Mercenaries just because I don't like memorizing map layouts, but it is good practice for Versus games. 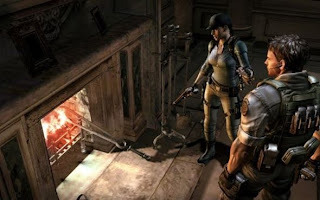 I'm excited about the campaign chapter, which lets you play out the game's prequel storyline, where Chris and Jill explore Ozwell Spencer's mansion before Jill and Wesker take a spill out a window. I predict it will be a fanservice recreation of RE1. Any excuse to jump back into the game, after all. I have plenty more gun upgrades to buy. Also, the final chapter in Assassin's Creed 2 comes out tomorrow. This is pretty impressive, considering that the 12th chapter came out like last week, and chapter 13 completes the story. I still haven't beaten the game, as I was waiting for all the missing chapters to drop before I experienced the ending. I do feel like it's a rip-off that actual parts of the story were held back for DLC, though one wonders how important those two chapters are overall. I certainly don't know yet. I have no idea how much all this DLC will cost, but I've got plenty of unspent PSN gift card money. If you folks out there in Readerland also have RE5 and want to get your co-op on, my PSN name is "Sillysaur." Join me--we'll rock it! When it comes to the evolution of birds, arguably the most contentious issue is the origin of flight. There have generally been two competing camps, those who argued that flight evolved from the ground up, and those who argued it evolved from the trees down.